Hudler is the Professor of Plant Pathology at Cornell University where he teaches a class with the same name as the book. His enthusiasm for and deep knowledge of his subject shine through. The book starts with an introduction about the structure, functions, and dispersal of fungi, and then spends a lot of time talking about how fungi have changed human history. “Mischievous” doesn’t really capture how destructive they have been! A lot of the historical evidence is circumstantial because the testable food and spores are long gone, but Hudler makes some convincing cases for fungal culpability. He says the Biblical Pharaohs’ years of famine were likely caused by fungally-induced crop failures because the Middle East used to be cooler and wetter it is than now, and Biblical witnesses describe being “blighted by the east wind,” which brings rain. These are just the conditions that fungi like. Unlike the Pharaohs’ famines, scientists know which pathogen caused the Irish Potato Famine, Phytophthora infestans. The potato blight caused by this tiny organism killed millions of people and caused millions more to emigrate. Our food crops are still vulnerable to attack by fungi at any time. He mentions barberry as a host for wheat rust disease. I suspected these plants were evil after I was vanquished by a ornamental barberry that left me with a painful and unreachable thorn under my skin for several weeks. Hudler more controversially argues that witch hunts throughout history were caused by fungus-infested rye which produces several alkaloid substances called ergot. Ergotism causes symptoms such as diarrhea, vomiting, feelings of heat, gangrene leading to loss of limbs and spontaneous abortions. Significantly for witch trials they are also known to cause seizures, hallucinations and psychosis. The book says that witch trials in Europe were closely correlated to cooler and wetter springs (from tree ring studies) and cooler and wetter places (such as river valleys). The Salem witch trials fit this pattern, as it was a cool time and the people most affected lived on damper, swampier land. But, of course molds and fungi also have positive human uses, from fermenting beer and making bread rise, to medicines. Alkaloids from ergots are used for several medicines and drugs, including a migraine drug and LSD. In fact, the known perception-changing effects of these substances lead some people to believe that they were used by Ancient Greek mystics. Perhaps the most important and well known medicinal use of fungi are the various species of Penicillium, which have forever changed our fear of bacterial infections. After reading Magical Mushrooms, Mischievous Molds, I have gained a new appreciation of of the fruiting bodies, spores, fungi, and molds that I see all around as I walk my dog in the forest (or see lurking in the back of my fridge). 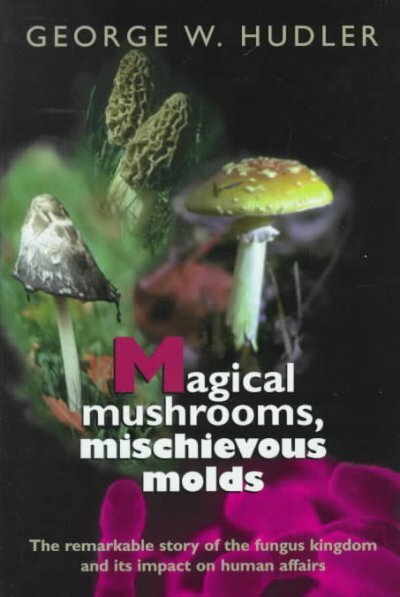 Our library has fungi cookbooks and guides but Magical Mushrooms, Mischievous Molds is unique if you like science writing, especially if you enjoy being grossed out by real organisms. Check the WRL catalog for Magical Mushrooms, Mischievous Molds. Books about mushrooms seem to be The Thing To Read right now! I work at a bookshop and so many people have come in looking for field guides and photo books about fungi. I don’t really understand the appeal, but this one does sound pretty interesting. Great review, and I’ll have to keep this book in mind when people ask for recommendations. If your weather is like ours, I think I have an explanation. We have had a wet summer here in southern Virginia and I have noticed a mushroom and toadstool explosion! After reading this book and writing this post I have been really looking at the fungi I see when I’m out with my dog. Among the ones I’ve noticed on the ground I have seen small golden ones that look like candelabra and white ones on thin stalks that look like venus fly traps (or aliens!). And on trees and fallen wood I have seen a great variety of bracket fungi. Since I’m in a library right now, I’m tempted to get a fungi guide and work out what they’re called!